Mangosteen is a fruit common throughout Southeast Asia that is one of the largest fruit in the world said to be the queen of fruits. Each seed is said to contain 6 patches of edible fruit. The outer skin of mangosteen is exceptional high in nutritional value, which is why it is recommended to be eaten. Chitosan in mangosteen helps lower cholesterol. The calories in Mangosteen per 25g(1item edible part) is 17 calories. 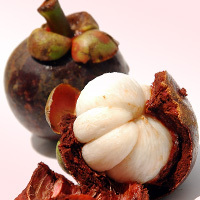 Mangosteen is calculated to be 67Cal per 100 grams making 80Cal equivalent to 119.4g with 4.38g of mostly carbohydrates、0.15g of protein、0.05g of fat in 25g while being rich in vitamins and minerals such as Vitamin B1 and Manganese.